By definition, then, a business that focuses on a niche is addressing a need for a product or service that is not being addressed by mainstream providers. Establishing a niche market give you the opportunity to provide products and services to a group that other businesses have overlooked. You can think of a niche market as a narrowly defined group of potential customers that have specific needs, a subset of a larger group. Think of the group of consumers interested in purchasing cleaning services, for instance. Instead of offering general cleaning services, a business might establish a niche market by targeting the portion of this market interested in blind cleaning services. Another business might occupy its own niche in this market by specializing in using only environmentally friendly cleaning products. Markets of any discernible size contain multiple subsets of potential markets - although not all of the possible niche markets will be worth targeting from a business point of view. Why Establish a Niche Market? Gaining expertise - becoming known as the specialist in a particular product or service makes your business more likely to be recommended to others by customers (and even other businesses). Customers are always looking for businesses that excel in their area of need. The trick to capitalizing on a niche market is to find or develop a market niche that has customers who are accessible, that is growing fast enough, and that is not owned by one established vendor already. See How to Find and Master a Niche Market for more information. 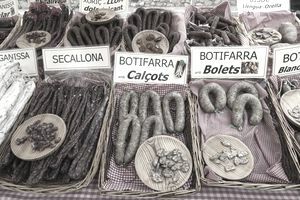 The huge demand for artisan foods is spawning many businesses to fill the niche, from specialty chocolates to cheeses, sausages, jams and jellies, to coffee roasting. Many successful artisan food businesses started out as one person cottage industries making products by hand. Sales of gluten-free products grew 34% year-over-year from 2010 to 2015, and total sales are expected to reach $2.34 billion in the U.S. by 2019 (Packaged Facts report authored by Howard Waxman). Local cafes and bakeries specializing in gluten-free products are popping up everywhere. Organic produce sales continue to grow as consumers become more concerned about the hormones and pesticides used in the growing of conventional food products. Organic food delivery services such as Good Eggs allow customers to shop online for fresh produce, fish, meats and dairy products (sourced from local farms). Door-to-door free delivery is provided. Specialty food trucks are becoming increasingly popular for consumers who wish something other than traditional fast food fare such as burgers, fries, and hot dogs. Enormously successful Clover Truck of Boston, MA runs a fleet of trucks that provide a seasonally changing menu that serves vegetarian meals made from mostly locally sourced, organic ingredients (and actually, they do serve french fries). Micro brewing is a very popular niche market in North America as beer connoisseurs increasingly prefer great tasting craft beer. According to Beer Canada statistics, the number of licensed breweries in Canada grew by 70% in the 5 years leading up to 2014. In the United States, the craft beer market has grown to $20 billion annually in sales. Home care services such as cleaning, meal preparation, etc. See The Best Business Ideas for Working for or with Seniors for more ideas. Specialty pet foods such as dog treats, raw foods, etc. What Is a Unique Selling Proposition and How Can I Create One?